In 1922 W.S. 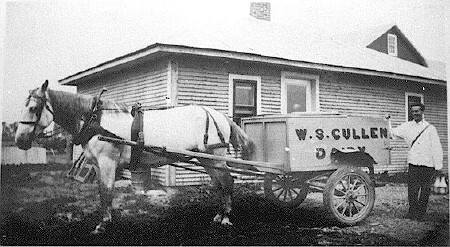 (Sam) Cullen started door to door milk delivery in Ormstown for six customers with milk from his high producing cows "Pleasant Valley Holsteins". In the 1930's pasteurized milk was sold 6 cents a quart. Later an homogenizing equipment was installed and business increased considerably. Deliveries were made from Trout River to St-Constant and the Lakeshore. At some point Lindsay Cullen took over the business from his father. In 1967, Lindsay sold the business to a Mr. Laplante who continued milk delivery for a couple of years. 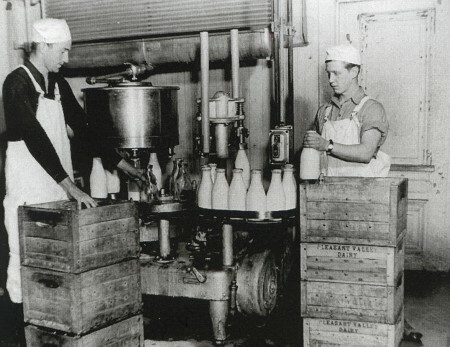 Later Guaranteed Pure Milk from Montreal took over the delivery of milk to customers and business in the Chateauguay Valley. At the biginning, Sam Cullen painted his name on the delivery wagon. Later he changed it for "Pleasant Valley Dairy"
On the left, Lindsay Cullen, the son of Sam Cullen the founder!